During his time as a professional footballer, Clark Carlisle was considered to be Britain’s brainiest footballer, even knocking a reigning champion off his perch on Countdown in 2010. Writing a full length book, however, was a different kettle of fish, as Clarke readily admitted during his amenable chit-chat with fellow former footballer, Pat Nevin, at the Edinburgh Book Fest His book,. 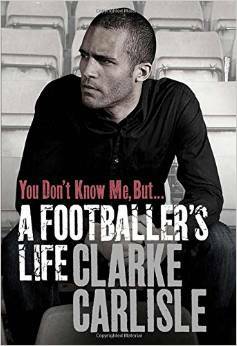 ‘You Don’t Know Me, But,‘ is an auobiographical confessional piece, in which Carlisle takes us from his multi-racial beginnings in Preston, to his recent position as chairman of the Professional Footballers Association. Clarke Carlisle is a lovely chap, a well-spoken & family man who finds himself these fays with the plumb job of commentating at premier league football matches. His talk touched a number of interesting places, such as his addiction problems & handling of the John Terry/Anton Ferdinand racial case. The best moment for me, however, came during the Q&A session, when an audience member asked Carlisle what was his favorite moment on the pitch. I was at Wembley myself in 2009, when Burnley triumphed over Sheffield United in the Championship play-offs. But this was only his second favorite moment. The first was scoring the last-minute winner for Blackpool against Carlisle, with his mum attending one of his football matches for the very first time. That moment, he said, is when he fell in love with football, & his animated demeanor as he told the story showed very much how that love is still there.